Saratoga County District Attorney Karen A. Heggen announced that Daniel A. Salas Miranda (DOB 06/21/78), of 776 State Route 9, Wilton, NY, was sentenced today in Saratoga County Court for causing the death of Michael Kornacki, before Saratoga County Court Judge James A. Murphy, III. Daniel A. Salas Miranda pleaded guilty on February 11, 2019 to Criminally Negligent Homicide, PL 125.10, a class E felony and Criminal Possession of a Weapon in the Second Degree, PL 265.03(3), a class C violent felony offense. At the time of his plea, Miranda admitted that he negligently discharged an illegal firearm inside his room at the Crest Inn on October 7, 2018 and that the bullet traveled through the wall of the adjoining room where it struck and killed his neighbor Michael Kornacki. Miranda also admitted his guilt with regard to unlawfully possessing a loaded firearm outside of his residence, acknowledging that after negligently firing the pistol he brought it to another room at the Crest Inn in an attempt to hide it. Assistant District Attorneys Charles Bucca and Mary Theresa Northrup prosecuted the case and thanked the victim’s family for their presence in the courtroom at today’s sentencing, noting that the defendant’s conduct resulted in irreparable harm to the surviving members of the victim’s family, most significantly his young daughter, who he loved and cared for. 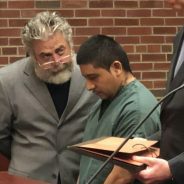 The defendant was sentenced to concurrent prison terms of 1 1/3 – 4 years and 10 years, followed by 5 years of post-release supervision and will be subject to deportation at conclusion of his prison sentences.